Immunoprecipitation of NIH/3T3 cell lysates using Rabbit (DA1E) mAb IgG XP® Isotype Control (Sepharose® Bead Conjugate) #3423 and Akt (pan) (C67E7) Rabbit mAb (Sepharose® Bead Conjugate). The western blot was probed using Akt (pan) (40D4) Mouse mAb #2920. This protocol is intended for immunoprecipitation of native proteins for analysis by western immunoblot or kinase activity. 20X Phosphate Buffered Saline (PBS): (#9808). NOTE: CST recommends adding 1 mM PMSF (#8553) before use*. To harvest cells under nondenaturing conditions, remove media and rinse cells once with ice-cold PBS. Remove PBS and add 0.5 ml 1X ice-cold cell lysis buffer to each plate (10 cm) and incubate the plates on ice for 5 minutes. Scrape cells off the plates and transfer to microcentrifuge tubes. Keep on ice. Sonicate samples on ice three times for 5 seconds each. Microcentrifuge for 10 minutes at 4°C, 14,000 x g, and transfer the supernatant to a new tube. If necessary, lysate can be stored at –80°C. Take 200 μl cell lysate and add 10 μl of the immobilized antibody, incubate with rotation overnight at 4°C. Microcentrifuge for 30 seconds at 4°C. Wash pellet five times with 500 μl of 1X cell lysis buffer. Keep on ice during washes. Proceed to sample analysis by western blotting or kinase activity (section D). Supplied in 10 mM sodium HEPES (pH 7.5), 150 mM NaCl, 100 µg/ml BSA, 50% glycerol. Store at –20°C. Do not aliquot the antibodies. 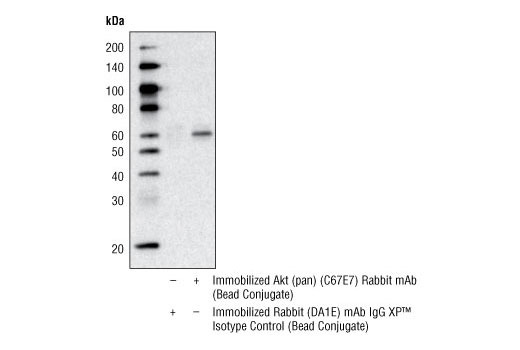 Akt (pan) (C67E7) Rabbit mAb (Sepharose® Bead Conjugate) detects endogenous levels of total Akt protein. This antibody does not cross-react with other related proteins. Monoclonal antibody is produced by immunizing animals with a synthetic peptide corresponding to residues in the carboxy-terminal sequence of mouse Akt. This Cell Signaling Technology antibody is immobilized via covalent binding of primary amino groups to N-hydroxysuccinimide (NHS)-activated Sepharose® beads. Akt (pan) (C67E7) Rabbit mAb (Sepharose® Bead Conjugate) is useful for the immunoprecipitation of Akt. The antibody is expected to exhibit the same species cross-reactivity as the unconjugated Akt (pan) (C67E7) Rabbit mAb #4691.